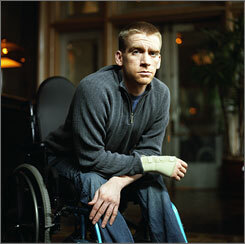 After years of suffering from severe war injuries, Tomas Young will be celebrated on May 19 at the Alamo Drafthouse Mainstreet in Kansas City, Missouri. A performance by Tom Morello of Rage Against the Machine will be featured as well as a screening of “Body of War,” a documentary about the 33-year-old paralyzed veteran. Less than a week into his deployment in Iraq, he was shot and paralyzed from the chest down. The film, “Body of War,” documents his life following Iraq, his coming to terms with his disability and how he became a voice for peace. Pearl Jam’s Eddie Vedder was inspired by Young to compose songs for the film. Shortly after the film was released in 2007, Young suffered a pulmonary embolism and had his colon removed. He has since been bed ridden and his speech is severely impaired. He recently announced that he plans to remove a tube he has been ingesting food from in order to end his life. Morello met Young after a screening of “Body of War,” and the two remained close. Morello’s solo act, The Nightwatchman, will perform at Young’s celebration, and was described as a “must see” by Young. Click here to watch the “Body of War” trailer and purchase the documentary. Proceeds go to organizations that aid wounded war veterans. Download free tracks from The Nightwatchman here.